This post is for Uncle Rocky, who requested me to put up some pictures of nanohana. Merin sent me this first picture, which I think was taken somewhere in Kansai. The fields of nanohana evoke memories of mustard back home. However, the best views of nanohana I have encountered have been down in Kagoshima, during the Nanohana Marathon. In the next picture, you can really see how vibrant this flower really is. Keep in mind that this picture was taken indoors under scant flourescent lighting. 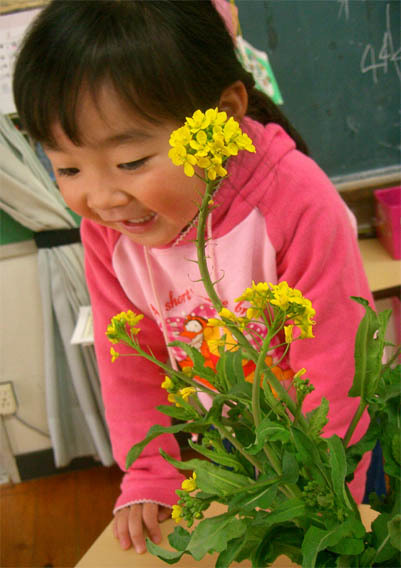 This is Akari-chan, one of my pre-school students. She reminds me of Merin because she is usually serious and stubborn on occasion. Only recently has she started smiling and laughing frequently. She is also really good at traditional Japanese dance, at only 5 years old. No problem Jeff- glad to see that someone else has good memories of nanohana.